This security camera's singular "grab-and-go" design stands out, but its feature set is too basic for serious DIYers. If U.K. smart home brand Hive hoped to immediately steal some of the shine from competitors with its new Hive View indoor camera, it has succeeded spectacularly. 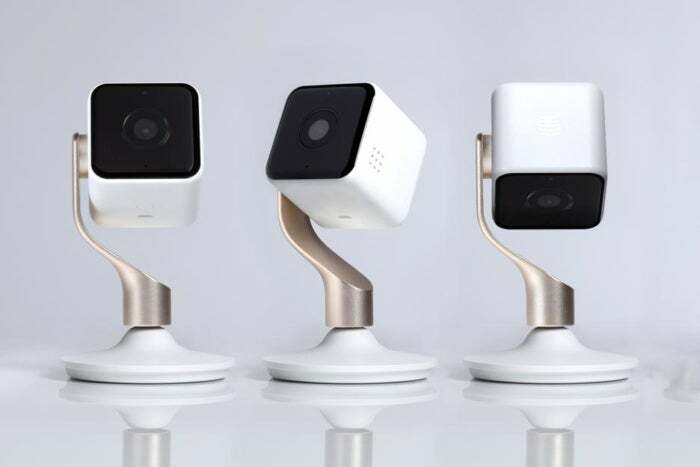 With is satiny finish and unique “grab and go” modular design—the creation of Swiss industrial designer Yves Béhar—this security camera impresses right out of the box. The cubed camera unit can detach from the magnetic mount on its lightweight brushed-metal stand and operate for short duration on battery power. That gives you the option of temporarily training the View on another room, such as when you need keep tabs on your children while you attend to something upstairs. It’s a design detail that will probably have a lot of utility for a lot of folks. That’s the limit of the View’s innovation, though. Inside you’ll find some fairly standard features: a 130-degree wide-angle field of view, 1080p live streaming, night vision, and event-triggered recording. Even its people-detection capability, which distinguishes between biped-triggered activity and all other motion, is common enough now that it’s not much of a differentiator. Along with the View, Hive has rolled out a new cloud service, Hive Video Playback. For $6 a month, you can view up to 30 days of video recordings (without this subscription, you get only 24 hours of storage with the camera purchase). As an inaugural offer, Hive is providing the first month gratis. The Hive View detaches from its magnetic mount so you can temporarily relocate it to other rooms. The Hive View is meant to be used as part of the brand’s larger smart home systems, so it’s being sold as part of the new Hive Close to Home starter pack. This includes lights, door and window sensors, plugs, and a Hive Hub for $350. Alternately, you can spread the cost of the hardware over two years at $14.58 per month. If you’re already a Hive smart home customer and want to add the View to your setup, or if you’re not but just want the camera, you can buy it standalone for $200 or purchase a double-pack for $340. Hive customers only need to plug in the View and tap “add new device” in the Hive app to begin the steps of getting the camera online. If the View is your first Hive product, you’ll have the additional steps of first setting up a Hive account. In either case, it’s a relatively painless setup process of connecting your phone to the camera via Bluetooth and then connecting to your Wi-Fi network. Activity is logged in a timeline from which you can play video clips of the triggering event. The camera stand’s sturdy circular base keeps it from being easily toppled off a table or shelf, but mounting hardware is also included in the package if you want to affix the View to a wall or ceiling. The stem can rotate and tilt, and the camera itself can rotate freely when attached to the stand, giving plenty of viewing-angle flexibility. The USB power cable attaches to the rear of the camera’s underside, though, so there may be a bit of maneuvering required to keep the cord from getting tangled with the stand, depending on how you contort the camera. 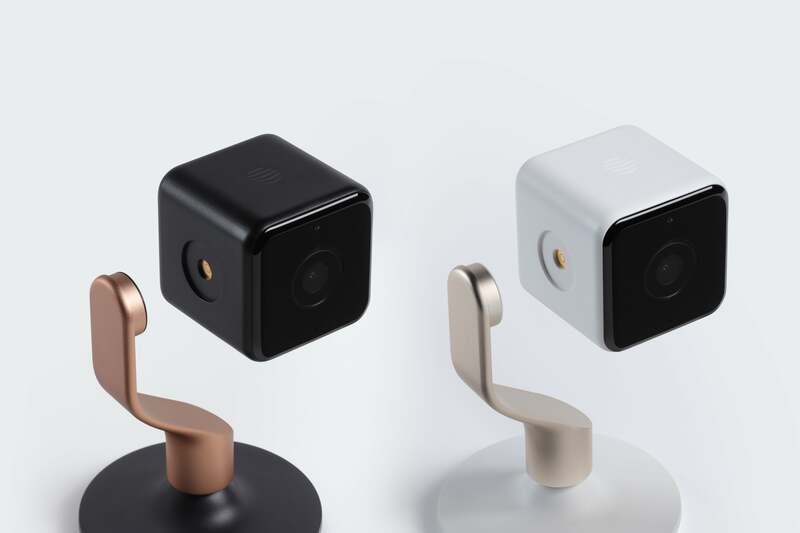 The camera cube detaches easily from its magnetic mount whenever you untether it to move to another room, and it reattaches with a satisfying click when you return it to its stand. I found myriad uses for this grab-and-go feature: monitoring my kids while I worked in another part of the house, making sure the cats stayed off the kitchen counters when I left cooking dinners unattended for a few moments, and even monitoring my front porch through a window on a day I was expecting a package. Really, the uses seem limited only by your daily rhythms and imagination. The battery only holds a charge for about an hour, but I found that to be more than enough for these ad-hoc uses. 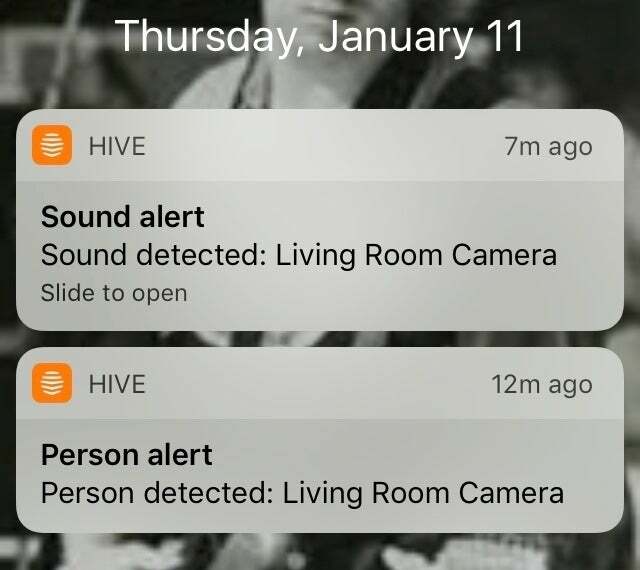 Managing the camera from the Hive app is pretty intuitive. 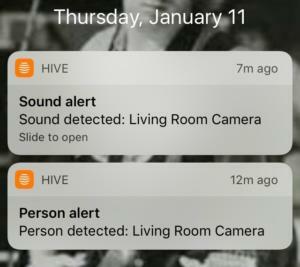 Once added, the View takes its place along with any other connected Hive devices in the app’s honeycomb display. Tapping the View’s icon opens the camera’s home screen, where the live stream is displayed above a timeline of detected motion and audio events. Tapping on any one of these events will play the corresponding video clip right in the live-stream window, so you can immediately see what tripped the camera’s sensors without having to lose time navigating to a separate video clip library. The timeline defaults to the present day, but you can toggle to a scrolling calendar that displays the current week and select another day’s recordings if you’re a Video Playback subscriber. The image quality was excellent, with vibrant colors and crisp details. Night vision illuminated my entire living room with even light and good contrast. Audio was strong as well, with no distortion or booming. Hive View accurately recognized human activity. The View’s complement of security features all worked pretty reliably. You can opt to be alerted to detected activity via push notification and/or email, and both of these methods were timely and accurate. I kept person detection activated most of the time and it unfailingly recognized the difference between the two-legged and four-legged members of the household. The View’s scheduling feature was also handy for limiting monitoring to designated hours so I didn’t have to disable the camera every time people returned home. The Hive app includes simple, intuitive controls for managing all of these features, making it easy to control the View even if you’ve never used a smart camera before. There’s no arguing with the Hive View’s good looks and the appeal of being able to temporarily relocate it without a big logistical hassle. But once you get beyond these perks, the View is a fairly ordinary camera. It lacks advanced but common features like geofencing and activity zones that provide better monitoring accuracy and flexibility. There’s also no Amazon Alexa or IFTTT integration (though other Hive products do work with the latter). Right now, despite being sold as part of a Hive smart home pack, the View doesn’t even work with other Hive products—the company says full integration will come in February. None of this means the Hive View isn’t a good camera. 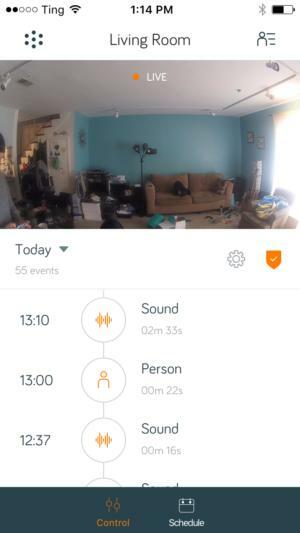 Its simplicity—along with the supremely user-friendly Hive app—make it a perfect option for security novice’s first smart cam. And if you’ve already invested in Hive products, the View is the no-brainer option for adding eyes to your smart home system. If you don’t fall into one of those camps, better options are out there. Beyond its innovative design, Hive view offers solid, if basic, features best suited to smart-home and security newbies.